Heavy Smoke Pours From Packer Park House Fire! A big warm thank you to all of the police and firefighters that came out to assist with the recent fire at Brinton Estates in Packer Park! 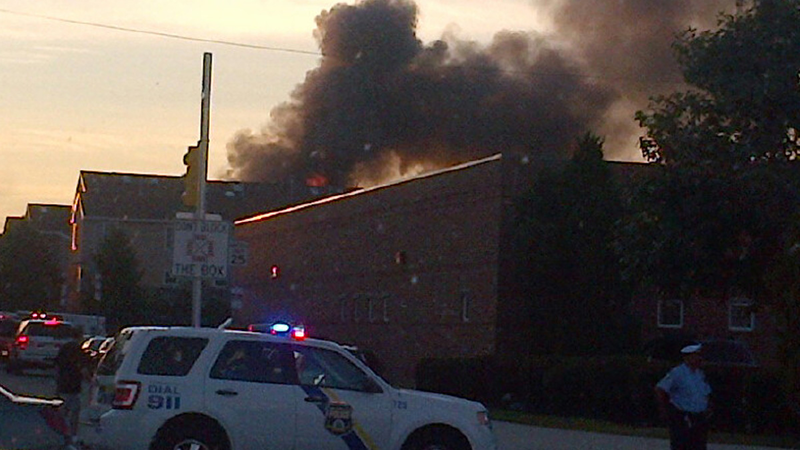 Click Here for News Story: Heavy Smoke Pours From South Philly House Fire! Luckily no one was seriously injured and everyone is ok! Three police officers are injured while rescuing an elderly woman from a house fire in South Philadelphia. The fire started around 6:30 p.m on the 3200 block of Chaucer Street in the Packer Park section of the neighborhood, near Citizens Bank Park. The fire quickly spread to at least four row homes on the block. “We were just walking out of the house and a neighbor came running up, and told us our deck was on fire,” said Mike Coplove. Dark, thick smoke was seen rising from the neighborhood and witnesses tell NBC10 they could even spot the flames from the ballpark. The three officers, who work in the 17th District, broke through the front door of that elderly woman’s home to help her escape. They were treated for minor cuts to their hands. The Red Cross is assisting 5 families whose homes were destroyed or damaged.The cause of the fire is under investigation. ← For Sale by Owner in Packer Park!